Amigurumi Bob Ross – Hello Adorable! OK. Maybe I’m totally revealing my age here, but man there was just something so soothing (and yes happy like happy clouds!) 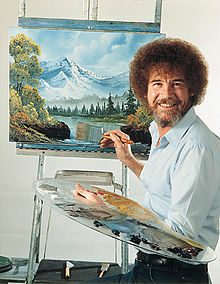 about watching Bob Ross’s TV show on PBS. This amigurumi (crocheted) rendition by Allison of CraftyIsCool does him justice.